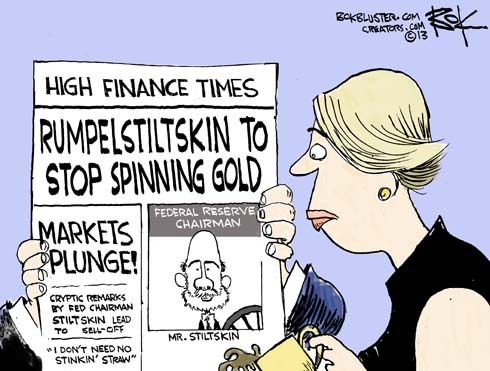 June 21, 2013 banking, Dollar, Economy, fox, Government, stock market, Wall St.
Rumpelstiltskin spun gold out of straw. Fed chief alchemist Bernanke spins dollars out of…I have no idea. But Wall Street somehow got the idea that he was thinking of not doing it any more and didn’t like it one bit. There are so many ” Bad Actors,” in this ADMin., Where do you Begin. Get rid of ALL of them. Save the Republic.